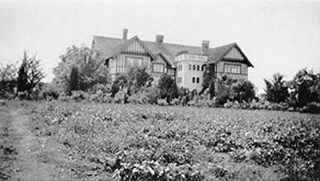 The F.J. Hart Estate, 'Avalon,' is comprised of 5.26 hectares of lakefront property now located within Deer Lake Park, an Arts and Crafts/Tudor Revival styled mansion and an associated later outbuilding. The mansion is now operated as the Hart House Restaurant. 'Avalon' and its estate grounds are important as an illustration of the cultural, aesthetic, and lifestyle values of the wealthy families that settled in the Deer Lake area early in the twentieth century. These values were predominantly those of elegant country living and leisure pursuits. The estate is important for its connection with wealthy land developer Frederick John Hart (1868-1945), who was not only instrumental in the creation of subdivisions which promoted Deer Lake as an exclusive residential development for successful families in the New Westminster and Vancouver area, but was also an influential member of this new suburban community and of the emerging municipality of Burnaby. Hart had a wide range of business, civic, and political interests: his real-estate company managed many of the land sales in the area and numerous other large developments throughout the region; he was an entrepreneurial businessman associated with a number of companies important to the economic development of the area and British Columbia; and he was a 'public spirited citizen' and an alderman for the City of New Westminster. The architectural style of ‘Avalon’ set the tone for many of the grand mansions in the adjacent residential development - British Arts and Crafts in derivation, with eclectic details, particularly Tudor precedents. 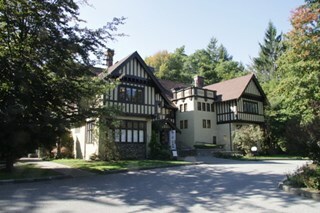 Designed for Hart and his wife Alice Chapman Hart (1867-1935) by Burnaby architect Frank William Macey (1863-1935), the use of references to Tudor England illustrates the relevance and importance to the residents of the area of a strong and visible connection with Britain. The first resident architect in Burnaby, Macey was born and trained in England where he was well-respected for having published two standard texts for the architectural profession. He settled in Burnaby in the first decade of the twentieth century and obtained a number of commissions from prominent businessmen who were building grand homes in the new community of Deer Lake. He designed mostly in the British Arts and Crafts style and introduced the use of rough-cast stucco for building exteriors, a characteristic for which he was renowned, and of which ‘Avalon’ is an excellent example. 'Avalon' is comprised of a single municipally-owned property located at 6664 Deer Lake Avenue, Burnaby.